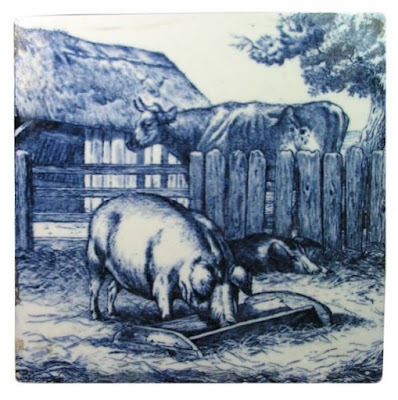 Mintons (1872-1950) late 19th century 6 inch tile from the "Animals on the Farm" series designed by William Wise. The last time I read "Animal Farm," I was about 14. I thought the story too babyish for me. Now I see it as a brilliant animal fable that skewers politics and people. The saying: "If you want to tell people the truth, make them laugh," sums up the story. Do you remember the words "All animals are equal, but some animals are more equal than others?" "Animal Farm" is a wonderful book to read in these political times (2016 Presidential Primary). Actually, any time. 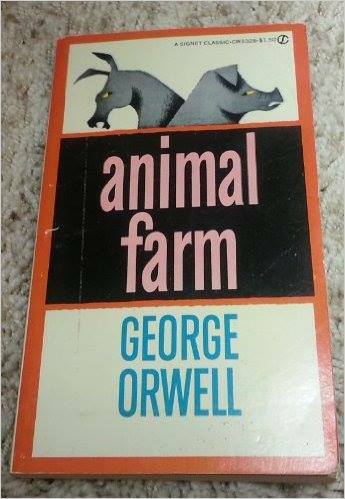 This is the cover used on the copy of "Animal Farm" that I read a long time ago.